Forest critters, retro robots and mod flowers, oh my! Quirky motifs combine to put 'Lil Mo Whimsy in a class by itself. Hand-tufted of soft mod-acrylic, this collection features hand-carving for added texture and a vibrant color palette to make it as fun as it is unique. 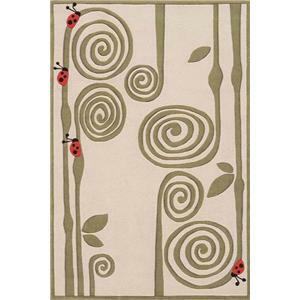 The Lil Mo Whimsy 5' x 7' Rug by Momeni at Belfort Furniture in the Washington DC, Northern Virginia, Maryland and Fairfax VA area. Product availability may vary. Contact us for the most current availability on this product. Momeni Inc. was formed and founded by patriarch, Haji Momeni in 1975. Producing products that appeal to the eye - and some consider art that you can walk on - this manufacturer definitely places looks first. Rugs that create a room or accent a room, no matter what you're looking for you can find it here with Momeni. The Lil Mo Whimsy collection is a great option if you are looking for furniture in the Washington DC, Northern Virginia, Maryland and Fairfax VA area.